App based taxi service provider, BookMyCab has been given licence by Delhi Government to operate in the capital city. However, there is no word on licence applications submitted by Ola Cabs or Uber. While the latter are still plying their cabs on Delhi roads, they have still not got the official licence to operate from the Government. 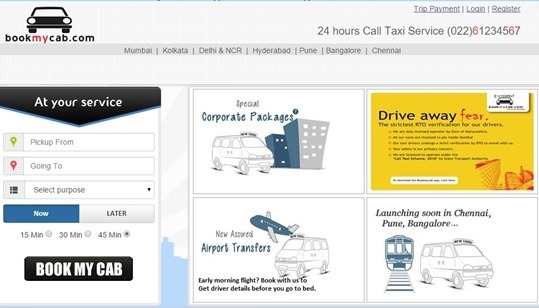 BookMyCab currently operates in 7 cities in India – Mumbai, Kolkata, Delhi & NCR, Hyderabad, Pune, Bangalore and Chennai. Interestingly, the licence given by Delhi Government allows allows BookMyCab to advertise on attached radio taxies, the taxi service operator said in a statement. Last month, Delhi Government had rejected applications from Uber, Ola and Taxiforsure that were filed under the modified radio taxi scheme introduced earlier this year. This is the second time their applications were rejected. They were earlier rejected in Jan of this year due to gaps in their applications. Immediately after the second rejection, Ola went ahead and filed a petition challenging Delhi Government’s decision to reject of Ola and Taxiforsure applications. The Delhi Court then observed that the decision to reject their licenses is invalid; and stated that the State Government will have to grant them a fresh hearing. Looking at this positive development, Uber also filed a similar petition on Friday to challenge the rejection of their licence application. However, it looks like Delhi Government is not going to cede that easily – After the court order for fresh hearing, a senior Delhi Govt. official had said that they will grant a new hearing, but immediately issue them a show cause notice as well. This means that the fresh hearing would only be a formality; It seems that Delhi Govt. has pre-decided that they will not allow them to operate. One of the reasons is that Ola and Uber remained operational even after their licenses were rejected. This definitely has irked Arvind Kejriwal led AAP Govt in Delhi!